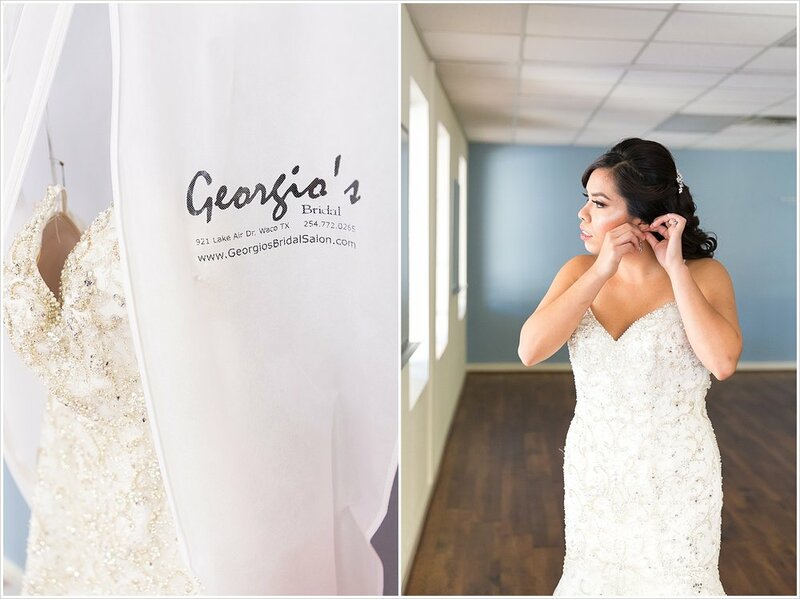 We ended 2017 with the beautiful, traditional church wedding of Henry & Cassandra on Christmas weekend, and we are so excited to show it to you! If you read Henry & Cassandra’s engagement blog post, you’ll remember these two Sweethearts met when they were younger because their families attend First Baptist Church, Waco together. So FBC was the perfect choice for their wedding ceremony! 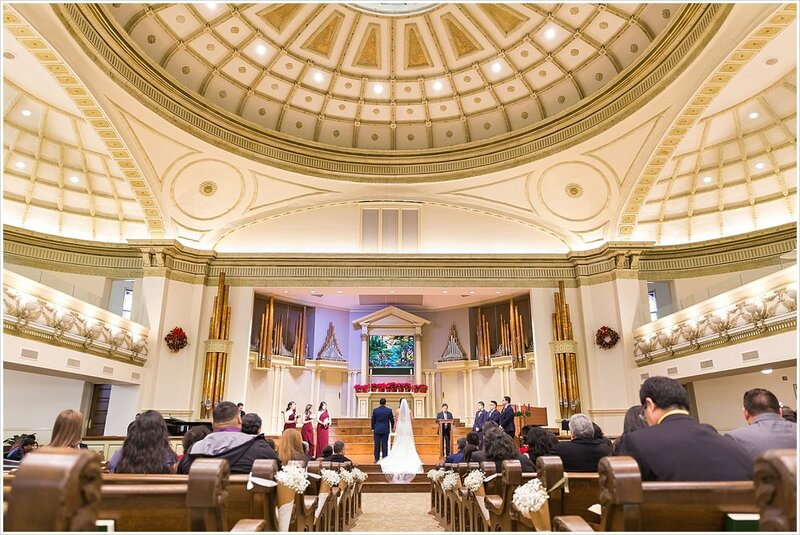 If you asked us what would be the most beautiful sanctuary in Waco for a traditional church wedding, FBC Waco will definitely be one of our top suggestions! 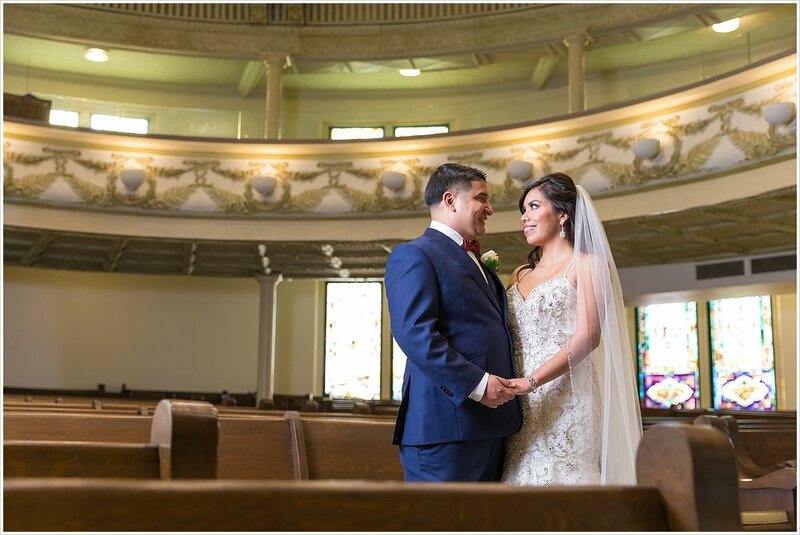 With the soaring ceilings, all the stained-glass windows, the rows of beautiful wooden pews, the architecture of the balcony...it is just such a gorgeous sanctuary! The beauty of the sanctuary and the small touches of red poinsettias for Christmas provided the perfect backdrop for Henry & Cassandra's wedding day. Henry & Cassandra continued the traditional theme of their wedding by choosing not to see one another before her walk down the aisle. However, to help calm their nerves and to have a special moment together before, they decided to do a “first touch.” We love when our Sweetheart’s choose to do a first touch, taking a moment to connect and talk together before saying "I do." Since we couldn’t find a great doorway without exposing Henry & Cassandra to all their guests who were arriving, Jason found a small bench in front of stained-glass windows on the second floor landing. I brought Henry up from downstairs and had him sit facing the corner, and made him PROMISE he wouldn’t turn around. Then while Jason got into place, I brought Cassandra out of her bridal suite and placed her behind Henry on the bench. 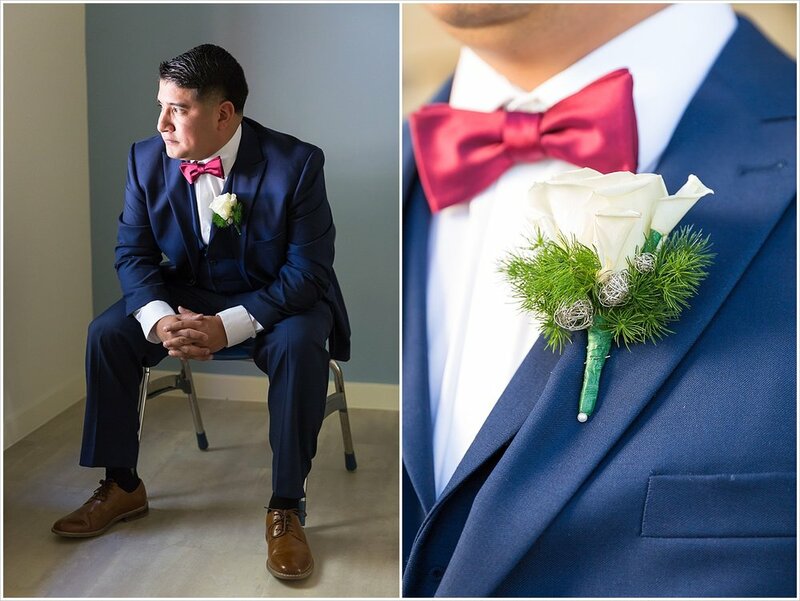 Maybe Cassandra was able to sneak a little peek at Henry before the ceremony and see him looking all dapper in his blue tux, but this location paid off in one of the most beautiful first touches we’ve photographed. After the first touch it was time for the ceremony, and it was such a meaningful ceremony filled with beautiful moments. 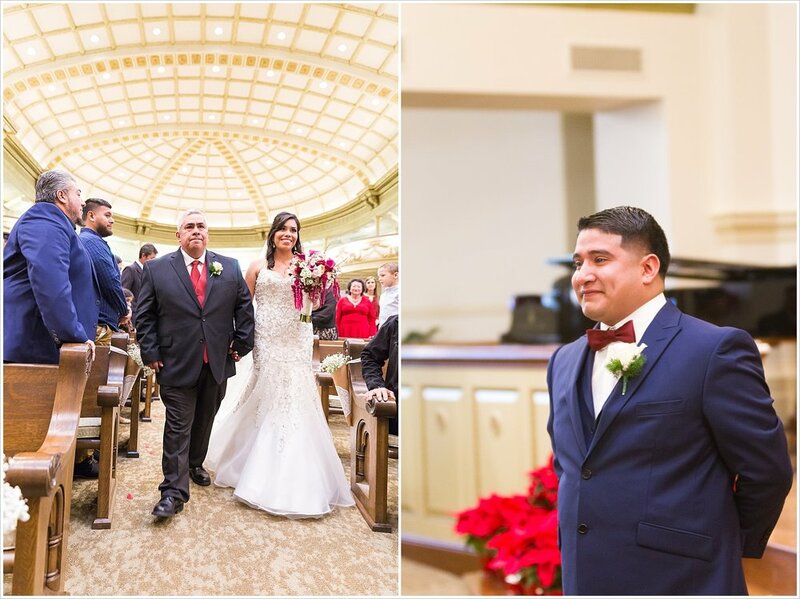 A pastor from Mexico closely connected with the family presided over much of the ceremony, encouraging Henry & Cassandra in their new roles as husband and wife. There was also a time in the ceremony when relatives and close family friends were invited to give traditional gifts to the couple getting married. One of our favorite parts was when Henry & Cassandra were encircled with the wedding lasso rosary during their time of prayer together. It was such a perfect symbol of marriage, being tied together, side-by-side as you journey forward. After the ceremony, Henry & Cassandra invited their guests to a fun-filled reception at Castle Heights Bijoux Events Center. They kept the traditional reception elements such as the Father/Daughter dance, toasts, and of course, cutting their gorgeous wedding cake! But there were some fun additions to the celebration we had never seen before in our experience as wedding photographers! Before Cassandra did her bouquet toss, she and Henry stretched her cathedral length veil between them and all the young women (and some young-at-heart) joined hands and ran through the venue and under the veil. Then, right before Henry tossed his boutonniere to the young, single men, they did the same! Also, a group of Cassandra’s cousins from Mexico swarmed Henry and tossed him up in the air to the music. He almost hit the ceiling! After all the cake had been served and the bouquet had been tossed, a family friend led the entire reception in a few rounds of competitive games. It was fun to see the women compete against the men, each team trying to win for the bride or groom! The fun reception ended with everyone praying over these Sweethearts, praying blessings on their new marriage as they left the reception to start their new life together. There were so many beautiful moments on your wedding day that we hope you cherish in your memory for years. We hope you remember the joy and emotions, the way all your family and friends came together to support your love and marriage. And we pray that the way you two smile at one another and the love in your eyes for one another doesn't fade but grows stronger with each anniversary. Blessings on your marriage! We’ve known Alex for a few years as the violinist for our church’s worship team. But when we were eating Steel City Pops with her and Charles and she shared they had met at Jiu Jitsu class, we were a little surprised. We didn’t even realize Alex was into Jiu Jitsu! Alex wanted to try something new so she enrolled in the class, and the instructor often paired her up with a fellow classmate, Charles. Week after week, Charles & Alex partnered up to learn new techniques in class, and it wasn’t long before these two realized something more than jiu jitsu was happening here. Alex’s desire to try something new, like jiu jitsu class, finds it’s match in Charles. When we asked them how they’d spend an unexpected free day together, their response was to try something new! A new restaurant, a new store, a new recipe in the kitchen, it didn’t matter. They were up for giving something new a try. So on a Saturday morning we drove out to Brazos Bluffs Ranch, a part of Homestead Heritage here in Waco, Texas, to photograph Charles & Alex on their adventure of trying something new. We explored the area a little bit and scouted out some locations, and then settled ourselves in our spot at the end of the trail to photograph Charles & Alex returning from their hour-long ride. Soon enough we heard the sound of horse hooves on the trail, and Alex & Charles appeared, smiling and enjoying themselves. And the smiling didn’t stop. Throughout the entire session, these two couldn’t stop smiling at one another. We’d offer some coaching to place them in a natural pose for a portrait, and they’d quickly only have eyes for one another. Alex was often looking up at Charles smiling, or Charles would look over at Alex and smile at her. We love when our Sweethearts openly show their love for one another in their sessions, and we do everything we can to make this a natural process for them. So it was so sweet to see how these two expressed their love by looking deeply into one another’s eyes and smiling so happily. And we think it made for some pretty romantic engagement portraits too. It was so fun joining y'all for your horseback riding adventure! (And thanks for letting us know this option exists in Waco!) Your love for one another comes across effortlessly, and we pray you guys have decades ahead of you filled with smiles. 3 1/2 weeks until your wedding day!! 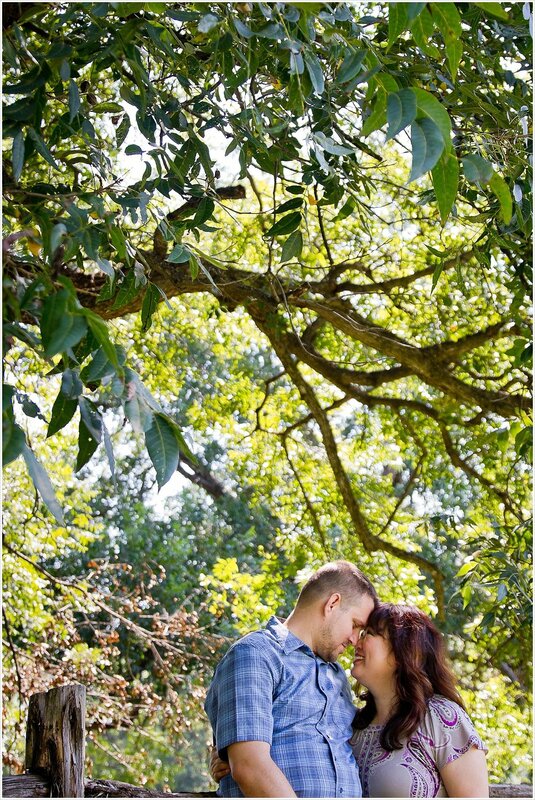 See more of our engagement photography below! Cory & Jackie are childhood friends of Jason's family, growing up in the same church and attending many youth group events together. Back in 2009, these high school sweethearts became engaged and asked us to take their engagement portraits. We were just starting out as wedding photographers and loved the opportunity to photograph some engagement portraits for friends. Cory & Jackie were one of the first engaged couples we photographed together...and by together I mean Jason took the pictures while I stood there holding our camera bag. I was still learning the ropes of photography way back then! We all agreed it would have been awesome if we had been able to photograph their wedding as well. But unfortunately, my family was taking a years-in-the-making vacation to Disney World that summer and we weren't available for Cory & Jackie's wedding. After their wedding, we'd occasionally connect with Cory & Jackie mostly through social media, especially when I began watching the entire Gilmore Girls series last year and Jackie, a Lorelei and Rory fan, would comment her theories and ideas on my MANY Facebook posts about the show. Then early this spring we received an email from Jackie, asking if we'd be available to do a photo session for them. You see, they were expecting their first baby! And while Jackie wasn't going to be far enough along in her pregnancy for a traditional maternity shoot when they were visiting family in Texas before heading back home to Nashville, TN, she didn't want to miss the opportunity to have portraits taken with us. She wanted to get some portraits of this time in their story, of the final months of it being just the two of them before their sweet little girl arrived in the fall. So one day we met them in downtown Waco. Jackie had seen the Starry Night mural mentioned online in her searches about things to see in Waco, and thought it would be a perfect backdrop for their portraits. And I couldn't agree more! Starry Night is actually one of my favorite Van Gogh paintings, and I told Jason we needed to take our own portraits in front of this wall too! After spending some time at the mural, we headed to the Carleen Bright Arboretum to use it's beautiful gazebo. See, Jackie had the PERFECT idea for a pregnancy announcement portrait that would make any Gilmore Girls fan squeal. So we set Cory & Jackie up like Rory and Lorelei in the final scene of the Gilmore Girls movie. Jackie and I had to coach Cory through how Lorelei looked when Rory revealed her pregnancy, but in the end he nailed it. And then we finished out their couple's session freezing time on some romantic moments between this husband and wife so years into raising their family they can look back on these portraits and smile. Congratulations once again on your little girl! We can't wait to meet her when she comes. We hope y'all enjoy these final months of just the two of you, and we're so excited for this new journey in your story!